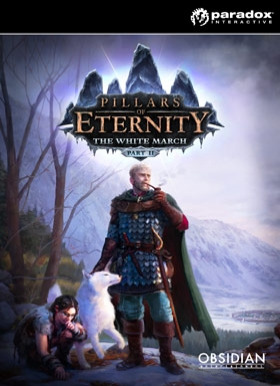 NOTICE: Requires the base game Pillars of Eternity and Pillars of Eternity - The White March: Part I in order to play. Activation key must be used on a valid Steam account. Requires an internet connection. About the game Pillars of Eternity: The White March - Part II is the conclusion to the grand expansion pack for Obsidian’s critically acclaimed RPG, Pillars of Eternity. Re… turning to the frozen north, your party will learn additional secrets about the gods of Eora as they adventure through brand new content. With the aid of a new companion, your party will face challenging new enemies and bosses. Key Features Climactic Conclusion Part II offers a climatic conclusion to the White March story, adding a wealth of new content to the world of Pillars of Eternity. Higher Character Levels Two new character levels have been included, adding dozens of new and unique abilities to the game while raising the level cap from 14 to 16. Story Mode For people who would love to experience the rich and deep story of Pillars of Eternity, Story Mode lets players get through combat more quickly. Stronghold Improvements The player stronghold has been updated to give special rewards, add rich stories, and present new challenges. New Barbarian Companion With the introduction of Maneha the Barbarian, all 11 classes of Pillars of Eternity now have a unique companion representing them, each with their own personalities and quests. Expanded Skill Uses Both the Athletics and Survival skills have been updated to be more compelling, allowing for greater choices in making unique characters that are tailored to your playstyle. Improved UI The character action bar has been made more streamlined, there is better feedback during combat, and there is a more comprehensive breakdown of your characters' stats. Knockout Injuries There is now an optional difficulty feature that inflicts long-term injuries when a character is knocked out in a fight. System Requirements Windows - Minimum OS : Windows Vista 64-bit or newer Processor : Intel Core i3-2100T @ 2.50 GHz / AMD Phenom II X3 B73 Memory : 4 GB RAM Hard Drive : 14 GB available space Graphics : ATI Radeon HD 4850 or NVIDIA GeForce 9600 GT Mac - Minimum OS : OS X 10.6.3 Leopard 64-bit Processor : Intel Core i5-540M @ 2.53 GHz Memory : 4 GB RAM Hard Drive : 14 GB available space Graphics : ATI Radeon HD 6750M or NVIDIA GeForce GT 330M Linux - Minimum OS : WUbuntu 14.04 LTS 64-bit Processor : Intel Core i3-2100T @ 2.50 GHz / AMD Phenom II X3 B73 Memory : 4 GB RAM Hard Drive : 14 GB available space Graphics : ATI Radeon HD 4850 or NVIDIA GeForce 9600 GT © 2015 Paradox Interactive™. Trademarks belong to their respective owners. All rights reserved.